Newly elected Uttar Pradesh Chief Minister Adityanath Yogi's Cabinet comprises of 5 woman, who are believed to be politically and socially strong. 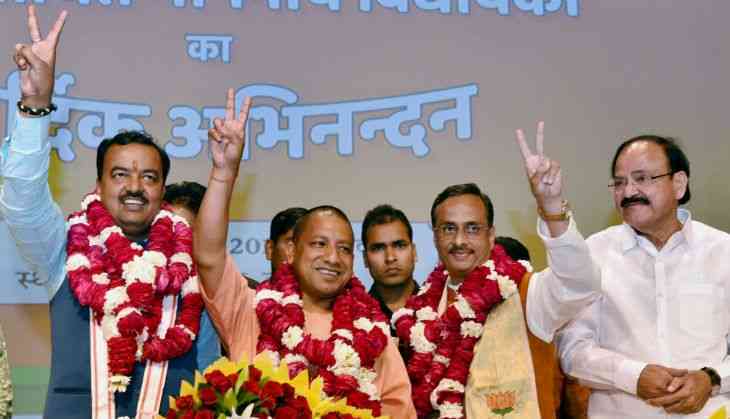 UP CM Yogi Adityanath was administered the oath of office and secrecy by Governor Ram Naik on 19 March along with two deputy CMs Dinesh Sharma and Keshav Maurya, 22 ministers, 13 MoS and 9 MoS with independent charge. Bharatiya Janata Party, which won 312 of the 403 seats in the state, had given tickets to 43 women candidates. 32 women candidates emerged as winners. The five women ministers are Dr Rita Bahuguna Joshi, Swati Singh, Gulab Devi, Archana Pandey and Anupama Jaiswal. Daughter of former UP CM Hemvati Nandan Bahuguna, Cabinet Minister Rita Joshi defeated Aparna Yadav, younger daughter-in-law of Mulayam Singh Yadav, on the Lucknow Cantt seat. Rita Joshi, sister of former Uttarakhand chief minister Vijay Bahuguna, was earlier President of Uttar Pradesh Congress Committee from 2007 to 2012. She sworn-in as Minister of State for independent charge. Swati Singh, wife of BJP leader Daya Shanakar Singh, is a faculty member in the Lucknow University. She emerged victorious from Sarojini Nagar constituency in Lucknow. Swati Singh's husband Dayashankar was last year expelled from the party following his objectionable remark against BSP president Mayawati in July 2016. His suspension was revoked by UP BJP chief Keshav Prasad Maurya after Swati Singh won from her seat. Minister of State Gulab Devi has become the dalit face of the BJP government in UP. She defeated SP's Laxmi Gautam and Virmawati (BSP) to win the Chandausi seat. She has won three times from here. Anupama Jaiswal won the Bahraich seat as BJP won this constituency after a gap of 25 years. Archana Pandey, daughter of former BJP minister Ram Prakash Tripathi, has won the Chhibramau seat by defeating Tahir Hussain Siddiqui (BSP) and Arvind Singh (SP).